I wake up at what becomes our typical morning rise – 5:30am. Mike is already up and packing his gear. He’s fresh and ready for another day. I monitor his breakfast to ensure he eats plenty because today will be a Bataan 16 mile march. The altitude and amount of climbing should be less strenuous but that distance carting a 35 pound pack isn’t trivial. The plan is to carve out a mini 3 day loop from the 160 mile overall Collegiates loop. Our original plan had been to hike southbound down the western loop but the snowpack changed that yesterday. And we obtained reports from other northbound thru-hikers that other segments are impassable as well. Today begins with a 6 mile stretch on a jeep road that follows Clear Creek down to its reservoir. We pass through Winfield, an old mining town – ghost town now – that sits unattended as a walk through museum of sorts. Pretty cool. The museum signs tell stories of water feuds and killings. About the time we discover we’re low on water ourselves, the creek becomes fenced in by a local ranch with no-trespassing signs that warn of prosecution. This is funny at first in light of the Winfield stories, but we actually are running low on water and have a full day’s hike in front of us. Our experience hiking this segment of the east Collegiates Loop in 2011 suggests we might not find much water. That was later in the year and the creeks should be running strong now, but do we risk it? We find a good spot to jump the fence and rehydrate our camelbaks on the private ranch land. Let them shoot us. This is a health and safety issue. We quickly reach the trailhead to the CT after this resupply and launch up a sizable hill. 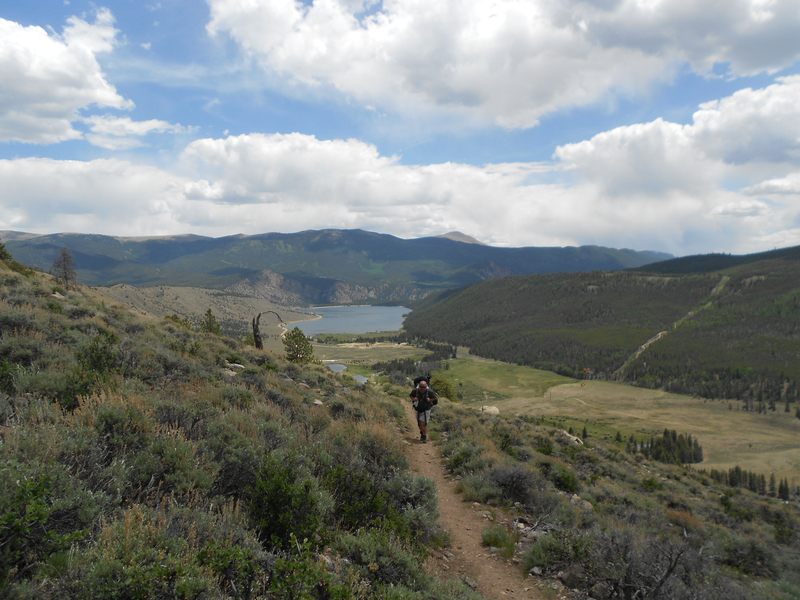 The first photo above shows us on this climb with Clear Creek Reservoir and the private ranch below us in the background. 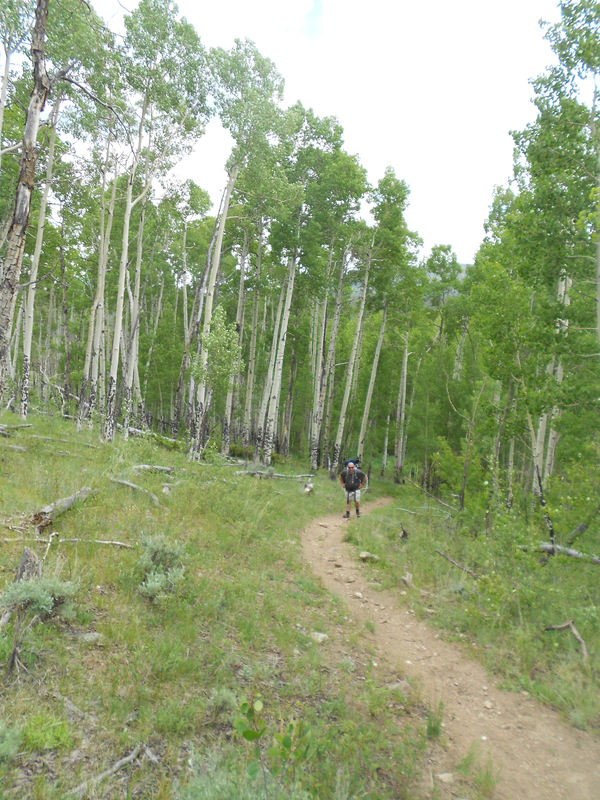 The top of the ridge has us enter countless aspen groves like the one pictured here. Turns out there are a couple of strong running streams once we crest the ridge. Fortunately the final ten miles on the eastern loop are mostly in the trees because today is hot. And we take advantage of every water source we encounter. We’re nearly giddy with relief once we spot the Twin Lakes coming down from a ridge. 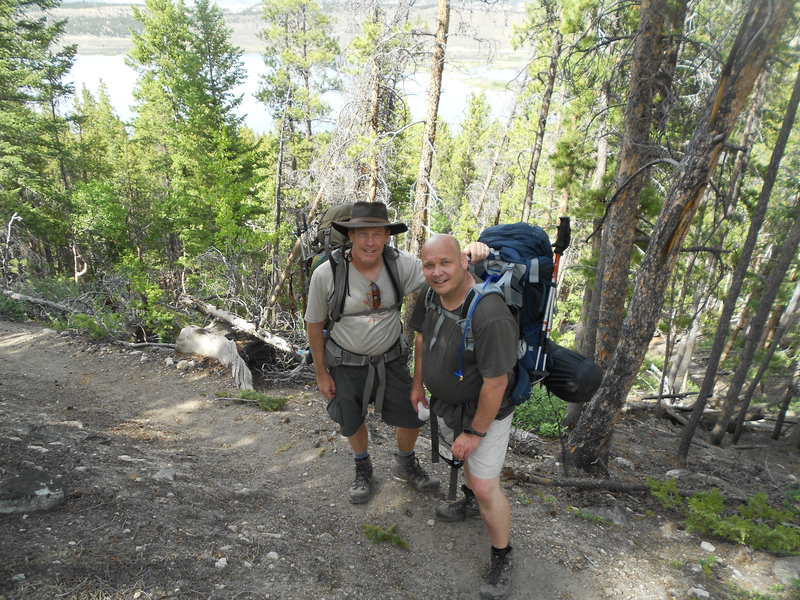 Sixteen miles with heavy packs, up and down massive hills, at altitude, is tough. Even La Plata, the trail master, is exhausted. 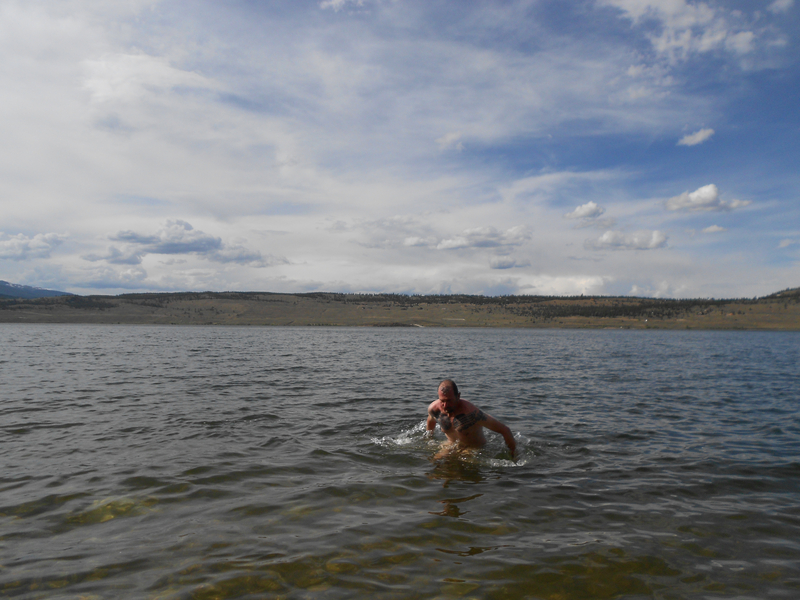 He revives himself by skinny dipping in the Twin Lakes. Likely as unauthorized as our water rustling earlier in the day. Mike and I soak our feet. We’re true trail trash by now. About the only thing we haven’t done is frequent respectable dining establishments with three days of sweat and trail dirt in our clothes and hair. We do that next. From the Twin Lakes trailhead, we drive 20 minutes south to BV – our newly adopted mountain town that serves as base camp. We dine at Eddyline Brewery and not one of us thinks to clean up in the restroom. Too much hiking in the sun makes you stupid. Total trail trash. Eddyline, as well as a micro brewery, is essentially a pizza and burger joint. I don’t recommend ordering a steak, it’s not their specialty. 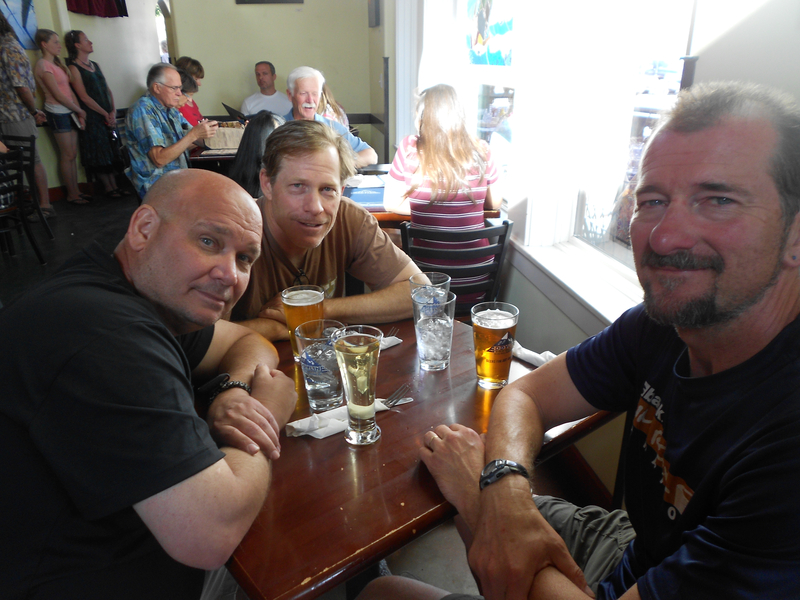 We’re all satiated with food and beer by the time we leave. We cross the street and stealth camp along the Arkansas River. Tomorrow will be a rest and recovery day at the Mount Princeton Hot Springs.